Bougainvilleas need a bright sunny position, but protection from direct sunlight under glass and a minimum night temperature of 10°C (50°F). As large climbers they can be planted directly into a conservatory border or grown in large containers. These can be placed in the garden in summer but must be kept frost free in winter. Enrich border soil with well-rotted compost and a balanced granular fertiliser or controlled-release fertiliser such as Osmocote. Use loam-based compost like John Innes 3 for containers. Bougainvilleas require a trellis or pillar for support and can be trained as a standard and spur-pruned to restrict size. They flower on the current seasons growth so pruning in late winter or early spring, just before growth begins. Propagate by semi-ripe cuttings taken with a heel in summer. Cuttings should root in 4-6 weeks or quicker with bottom heat of 15°C (50°F). Alternatively, take hardwood cuttings in deep pots in winter with bottom heat of 3-6°C (5-10°F) above the air temperature to encourage rooting. These late season cuttings may take three months to root. 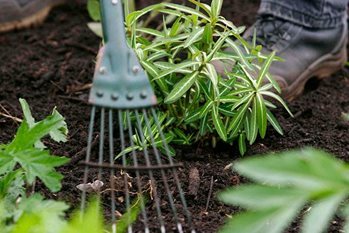 Layering in late winter and early spring is usually more effective and new plants will flower in 2-3 years. Only two species and one hybrid of Bougainvillea are generally in cultivation in this country and B. glabra and the hybrid B. × buttiana (B. glabra, B.peruviana) are best for containers as they flower when young. They are generally disease free but may be attacked by whitefly, mealybug, aphid and red spider mite. Avoid leaf drop in winter by maintaining a minimum night temperature of 10°C (50°F) with the day temperature a few degrees higher. Non-flowering – prune established plants in May and expose to cooler temperatures to stimulate flowering.